Defence Secretary Gavin Williamson meets Scarborough sea cadets at the Lifeboat House today. Defence Secretary Gavin Williamson today announced that HMS Duncan will be affiliated with Scarborough, just months after the town was selected to host national Armed Forces Day in 2020. 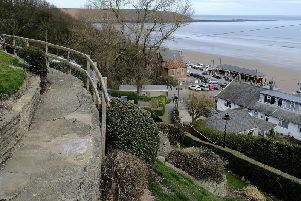 The ship’s affiliation with the town will build on Scarborough’s strong sea cadet links and historic support of the Armed Forces, and will also see the ship’s company make regular visits to the area. Defence Secretary Gavin Williamson, who was born in Scarborough, made the announcement during a visit to the town’s RNLI station to meet sea cadets. HMS Duncan is a cutting-edge Type 45 destroyer that was brought into Royal Navy service in 2010. She recently featured in hit documentary Warship: Life at Sea, which followed the personnel on board as they were buzzed by 17 Russian fighter jets in the Black Sea and supported Syrian air strikes. The ship is armed with the Astor air defence missile system and has a radar capable of tracking thousands of targets while simultaneously coordinating multiple missiles in the air at once. She is also equipped with the state-of-the-art Harpoon Anti-Ship missile. Mr Williamson said: “HMS Duncan has already proved her might on the world stage, from her deployment to the Black Sea leading a NATO task force to her crucial work patrolling home waters. With more than 14,000 members of the Armed Forces and Reserves hailing from Yorkshire, the region already has a strong affiliation to the military. Scarborough also has a thriving sea cadet unit, which celebrates its centenary next year, and provides outstanding support to veterans through the Heroes’ Welcome scheme. Leader of Scarborough Borough Council, Cllr Derek Bastiman, said: “We are extremely honoured and delighted to have HMS Duncan affiliated with the Borough of Scarborough. It couldn’t be a more fitting match as the son of one of our Cabinet members, Seaman Phillips, who is a serving member of the Royal Navy, has joined the ship’s crew. The direct connection to our council and borough communities gives us immense pride. The son of Cllr Heather Phillips, Leading Seaman Tim Philips joined HMS Duncan in August this year. And the town’s military ties will continue to strengthen as it prepares to host more than 200,000 people for Armed Forces Day in 2020. The national event will see thousands of serving sailors, soldiers, airmen and women, alongside cadets, veterans and charities, descend on the town to celebrate the important work done by British forces across the world. Mr Williamson was born in Scarborough in July 1976 and went to Raincliffe School and Scarborough Sixth Form College.